We report an unusual case of hydroxychloroquine (HCQ) toxicity after only 2 months of starting the treatment. A 42-year-old woman presented with visual impairment. Her visual acuity was 20/20 in the right eye and 20/25 in the left eye. Ophthalmologic examination revealed a bull's eye pattern in both eyes which was more prominent in the left eye. She had received HCQ therapy (400 mg/day) for 1 month, and had been taking 200 mg/day for 1 month for the treatment of rheumatoid arthritis. HCQ macular toxicity is rarely seen in short-term use, before 5 years, and to our knowledge, there is only one other case reported in the literature. Hydroxychloroquine (HCQ) (Plaquenil, Sanofi-Aventis, Bridgewater, NJ) has been the mainstay treatment for inflammatory diseases such as systemic lupus erythematosus (SLE) and rheumatoid arthritis (RA) since the 1950s. Despite HCQ's high safety profile and long-term usage, the drug's ocular side-effects have gained increasing attention in recent years. In contrast to previous studies, which reported rare ocular side-effects (estimated 0.5–2% of long-term users),,, a 2014 landmark study revealed that retinal toxicity might be as high as 7.5% in prevalent HCQ users. The risk is highly dependent on daily dose by weight; lower risk was achieved with doses of ≤5 mg/kg real weight. Retinal toxicity from HCQ can be severe and is usually irreversible. Regular screening can detect retinal changes at an early stage before retina pigment epithelium (RPE) damage and significant visual loss. Cessation of HCQ when early toxicity is revealed inhibits progress sufficiently to avoid damage to the fovea, and therefore, prevents clinically noticeable visual loss. Hence, it is important for ophthalmologists to understand the risk of retinal damage in HCQ users, and it is essential that patients taking the drug are followed appropriately and retinopathy diagnosed early. Here, we report a case of HCQ macular toxicity in a patient who had been taking the drug only for 2 months. A 42-year-old woman presented with a history of progressive deterioration in vision in her left eye and narrowing of the visual field. Her medical history included RA, for which she had received HCQ therapy (400 mg/day) for 1 month and had been taking 200 mg/day for 1 month. The patient weighed 70 kg and had no history of kidney or liver dysfunction. She denied previous exposure to HCQ or any other medications. On ophthalmologic examination, her visual acuity was 20/20 in the right eye and 20/25 in the left eye. Biomicroscopic examination of the anterior segment was normal in both eyes. Fundoscopic examination revealed a ring of depigmentation of the RPE in the macula, which showed a bull's eye pattern in both eyes but more prominent in the left eye [Figure 1]a and [Figure 1]b.
Fundus autofluorescence showed a hyper-autofluorescent parafoveal ring in both eyes, suggestive of damage to the RPE [Figure 2]. Spectral-domain optical coherence tomography (OCT Spectralis, Heidelberg Engineering, Heidelberg, Germany) showed the flying saucer sign secondary to the perifoveal RPE atrophy with a loss of the retinal inner segment/outer segment junction with foveal preservation in the left eye [Figure 3]. Standard automated perimetry (HFATM II; Humphrey Instruments Inc., San Leandro, California, USA) with 30-2 visual field testing showed paracentral scotoma in the right eye and a dense, well-defined paracentral ring scotoma in the left eye [Figure 4]a and [Figure 4]b.
Electrophysiological tests revealed maculopathy with decreased multifocal electroretinogram (mfERG) values. A diagnosis of HCQ-induced bull's eye maculopathy was supported, and the patient was advised to discontinue the drug. At 6-month follow-up, visual acuity remained stable in both eyes without any further changes on OCT and mfERG. Visual fields showed bilateral paracentral scotomas. 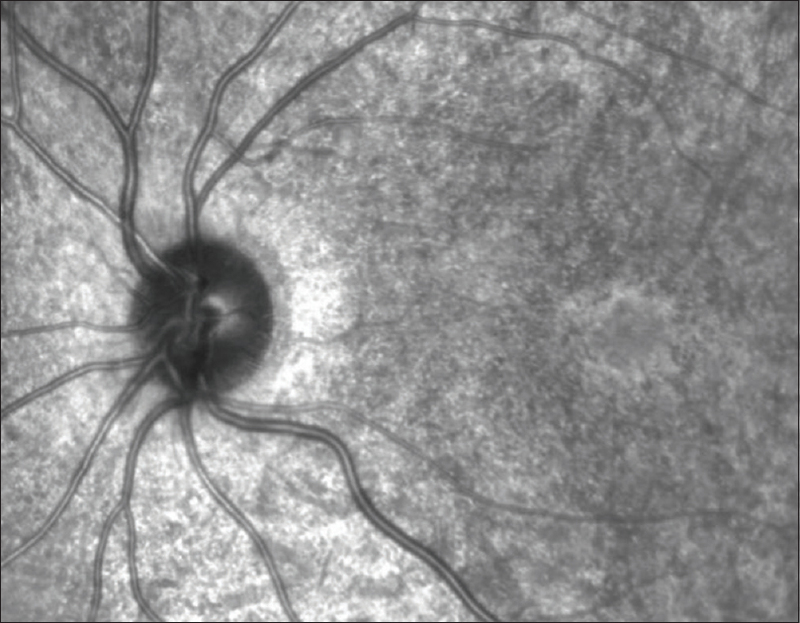 In this case report, we present a patient with early-onset and low-dose HCQ macular toxicity. Marmor and Melles indicate that the most critical risk factor for the development of HCQ toxicity is excessive daily dose by weight and the duration of use (which is linked to dosage as a critical factor). These authors also demonstrated that the prevalence of retinal toxicity is less than 1% in the first 5 years and less than 2% in the first 10 years of HCQ use for individuals prescribed doses of ≤5.0 mg/kg. Based on this data, the American Academy of Ophthalmology (AAO) issued weight-based recommendations for HCQ dosing in recent guidelines, that is, the users should stay below the dose of 5 mg/kg real weight to optimize dose versus risk. Our patient did have one significant risk factor for toxicity in short-term use. The recommended dosage of <5 mg/kg/day based on real weight was exceeded for 1 month; the ideal dose should have been <350 mg/day. Furthermore, it is suggested that some patients have a genetic predisposition to HCQ toxicity, and that polymorphisms in the cytochrome P450 gene might influence blood concentrations. Unfortunately, genetic analysis could not be performed in our case. Another possible contributing factor is that the patient was started on dexketoprofen trometamol, a nonsteroidal anti-inflammatory drug (NSAID), simultaneously with HCQ treatment. Both drugs are metabolized in the liver by cytochrome P450 enzymes., It is possible that these drugs interfered with the normal cytochrome P450 metabolism and excretion of HCQ, leading to early toxicity. The only presented case report similar to our case in the literature took a dose of HCQ 200 mg/day for 2 months, associated with the occasional use of NSAIDs and concomitant treatment with methotrexate, which could involve pharmacological interaction caused by liver and kidney metabolization. If screening is conducted properly, toxicity could be detected before vision is significantly affected. The AAO recommended that all patients beginning HCQ therapy should have a baseline ophthalmologic examination within the first year of starting the drug to document any complicating ocular conditions and to record the fundus appearance and functional status. If the initial risk of HCQ retinopathy is low in a proper dose and the absence of risk factors, annual screening may be postponed for up to 5 years of exposure. Earlier annual screening should be considered if the risk is high such as high dose and long duration of use, concomitant renal disease, or use of tamoxifen. The primary screening tests are automated visual fields, spectral-domain OCT, multifocal electroretinogram, and fundus autofluorescence. HCQ retinopathy is not reversible and cellular damage may progress for a number of years even after the drug is stopped. Therefore, it is essential to continue following the patient appropriately. Development of HCQ toxicity in short-term use, as in the present case report, might indicate that maculopathy is caused by multifactorial etiologies. Further studies are needed to understand the toxicity mechanisms. Despite the fact that HCQ maculopathy might arise because of multifactorial etiologies, dosage is a critical, controllable factor relevant to minimizing the risk of retinal toxicity. Wolfe F, Marmor MF. Rates and predictors of hydroxychloroquine retinal toxicity in patients with rheumatoid arthritis and systemic lupus erythematosus. Arthritis Care Res 2010;62:775-84. Mavrikakis I, Sfikakis PP, Mavrikakis E, Rougas K, Nikolaou A, Kostopoulos C, et al. The incidence of irreversible retinal toxicity in patients treated with hydroxychloroquine: A reappraisal. Ophthalmology 2003;110:1321-6. Melles RB, Marmor MF. The risk of toxic retinopathy in patients on long-term hydroxychloroquine therapy. JAMA Ophthalmol 2014;132:1453-60. Marmor MF, Hu J. Effect of disease stage on progression of hydroxychloroquine retinopathy. JAMA Ophthalmol 2014;132:1105-12. Marmor MF, Kellner U, Lai TY, Melles RB, Mieler WF. Recommendations on screening for chloroquine and hydroxychloroquine retinopathy (2016 revision). Ophthalmology 2016;123:1386-94. Chiang E, Jampol LM, Fawzi AA. Retinal toxicity found in a patient with systemic lupus erythematosus prior to 5 years of treatment with hydroxychloroquine. Rheumatology (Oxford) 2014;53:2001. Shroyer NF, Lewis RA, Lupski JR. Analysis of the ABCR (ABCA4) gene in 4-aminoquinoline retinopathy: Is retinal toxicity by chloroquine and hydroxychloroquine related to Stargardt disease? Am J Ophthalmol 2001;131:761-6. Lee Y, Vinayagamoorthy N, Han K, Kwok SK, Ju JH, Park KS, et al. Association of polymorphisms of cytochrome P450 2D6 with blood hydroxychloroquine levels in patients with systemic lupus erythematosus. Arthritis Rheumatol 2016;68:184-90. Furst DE. Pharmacokinetics of hydroxychloroquine and chloroquine during treatment of rheumatic diseases. Lupus 1996;5:S11-5. Hedner T, Samulesson O, Währborg P, Wadenvik H, Ung KA, Ekbom A. Nabumetone: Therapeutic use and safety profile in the management of osteoarthritis and rheumatoid arthritis. Drugs 2004;64:2315-43; discussion 2344-5. Hernandez Bel L, Monferrer Adsuara C, Hernandez Garfella M, Cervera Taulet E. Early macular toxicity following 2 months of hydroxychloroquine therapy. Arc Soc Esp Oftalmol 2018;93:20-1.